Bogen HSR Series (HSR6) $199 ! 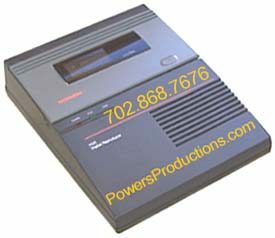 Message On Hold Digital Players "AutoLoad"
In addition to our Message On-Hold recordings and a wide variety of new digital equipment we also have "Lab-Certified"
Pre-Owned Digital Message On-Hold Recorders/Players (below) to save you a tremendous amount of money! PLEASE CALL FOR AVAILABILITY !  Dimensions: 7-7/8" x 6-3/8" x 3-1/4"
If power to the unit should ever be interrupted, the HSR will automatically reload the program from the tape left in the unit. These Lab-Certified Pre-Owned Digital devices include a tremendous savings when compared to purchasing new. We include a 1 year repair/replace warranty along with all of the extras you would receive if buying new. Simply insert a cassette... the HSR automatically assesses the audio start and stop points, sets the record levels, digitally downloads and goes into "loop" play mode. "Digital Download" means the cassette only plays once during the initial load into the HSR's internal memory, then shuts off. The actual looped audio is playing from internal audio memory chips. You have little worry of a tape breaking from continual use since it only needs to play once. Changing messages is as easy as inserting a new tape. When the HSR downloads the new tape program, it automatically erases the previous program. The HSR "Digitally" samples your audio cassette for a most superior on-hold sound quality. In addition, a specialized audio editing circuit creates seamless audio with no "dead air." The HSR employs full microprocessor control. Since the digital circuitry has no moving parts, playback is extremely reliable. The built-in tape mechanism is only used while loading is in progress, and is not subject to the constant wear of traditional tape based systems. Besides supplying music to hold buses, the included mini-jack provides a dual-function trigger input that gives these units added flexibility. Trigger the one-time play with a momentary closure (push button switch, motion detector switch, etc.) to have the HSR play an entire message one time and stop. Additional contact closures that happen during the message play are ignored. This is a great feature for museums, promotional displays, and security announcements and people greeters.  Click here and find out how to receive our on-hold courtesy message for only $10 more (a $79 value). Only $209 complete!  We also sell Factory Fresh Bogen® ProHold, Nel-Tech Labs, Premier Technologies, On Hold Plus, Viking Electronics, Skutch Electronics and other brands. Just contact us for today's lowest price. Here's a great way to upgrade your older unit, replace your current unit or simply purchase your first Digital Message On Hold Player! These Pre-Owned devices have been cleaned and sanitized, then electronically and mechanically restored and certified by our own lab. While they may contain some surface use, most importantly they sound & work great! For peace-of-mind, we back them up with our one year repair/replace warranty. These units listed for hundreds more when new, so you can see just how much you are saving by purchasing "Pre-Owned." We include a user's manual, AC "wart" power supply, audio connecting wire, adapter plugs & jacks, rubber feet (wall mount or desktop), wall mount template and wall mounting hardware (where applicable)... all the "extras" as if you had purchased new. These units are complete. Connecting to your PBX/KSU Key phone system or other interface is so simple that in almost every case there is no need to ever call your phone maintenance person. We even offer limited telephone support for free, if even necessary. Once connected to your system's audio input (MOH) jack you simply open the cassette transport door, drop in your audio cassette, close the door and walk away. The unit's microprocessor loads the audio once into internal "Digital" memory to be electronically "looped." The only time your transport is utilized is during the initial load or reload procedure allowing for much trouble free service. Note: These devices may come with original manufacturer branding, including Bogen, Nel-Tech Labs, Interalia, On Hold Plus, Viking Electronics, Skutch Electronics, and others, or may have third party branding, including AT&T, Lucent, Avaya, Magic On Hold, Inter-Tel and others. Model names may include MMT, HSR, ProHold, DMOH, Soundbrick®, Messenger® (and others). Third parties may have different keying colors when compared to the original manufacturer's colors.